Twin Valley League rivals Valley Heights and Troy will square off for a second time this season, but this time is for a spot in the 2-1A state quarterfinals. Troy won the earlier meeting over the Mustangs, 42-25. The Trojans jumped out to a 20-0 lead in the second quarter, but Valley Heights rallied to within 28-19 to start the fourth quarter. Troy senior quarterback Tristan Speer passed for 172 yards and two touchdowns in that game. He also ran for 45 yards and a score. Speer has had a huge senior season in completing nearly 69 percent of his passes for 1,989 yards and 31 touchdowns with only one interception. The receiving group is talented with senior Collin Jasper pacing Troy with 36 receptions for 615 yards and 12 scores. Senior Jake Ross has 34 catches for 522 yards and eight touchdowns, while sophomore Cuttar Huss has a team-high 38 receptions for 609 yards and seven scores. The Trojan offense has been balanced with 55 percent of their total offense coming via the pass. When they run, senior Derek Franken leads the team with 550 yards and six scores. Valley Heights, on the other hand, keeps things primarily on the ground. The Mustangs feature sophomore Logan Woodyard who has totaled 940 rushing yards and nine touchdowns, while junior Keaton DeWalt has 821 yards rushing and 12 scores. Quarterback Gage Woodyard has rushed for 457 yards and ten touchdowns, but has has completed just 38 percent of his passes for 241 yards and a touchdown with three interceptions. Valley Heights rushed for 290 yards against Troy in the first meeting, and will need to control the ball and the clock to keep Speer off the field. Perhaps the premiere game of the 2-1A first round features Marion at No. 4 Lyndon. Marion is in its first season in Class 2-1A after reaching the second round of the 3A playoffs a season ago. The Warriors three losses have all come to playoff teams in Hutchinson Trinity (3A), Ell-Saline (2-1A) and Meade (2-1A). Lyndon, on the other hand, suffered only a 36-28 loss to Olpe back in Week 7. The Tigers reached the state semifinals in 2-1A a season ago before being eliminated by eventual champions Centralia. The Warriors and Tigers share five common opponents this season. The teams have picked up win in each of those five cases but Lyndon edged the Mission Valley 36-30 back in Week 2, while Marion throttled the Vikings 72-14 last week. Marion put up more than 515 yards of total offense in that game. The Warriors are led by quarterback Jacob Baldwin and running back Adam Janzen. Janzen surpassed the 1,000-yard mark on the season last week. 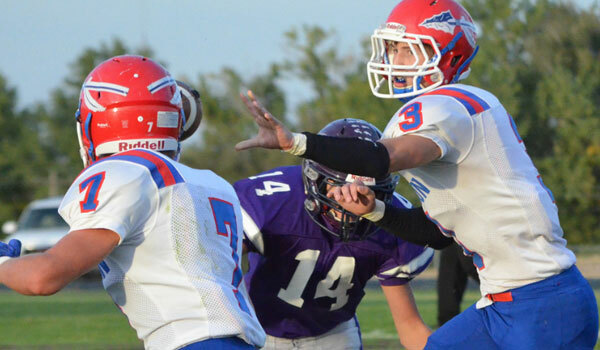 Lyndon has a talented quarterback in Dawson Swinehart. Swinehart has rushed for 1,567 yards and 25 touchdowns this season while passing for an additional 570 yards and five scores. Senior Daniel Burgess is also over the 1,000-yard mark on the ground with 1,018 yards and 15 scores. Look for this to be one of the better games on Friday night. This marks another installment in the premier Class 2-1A rivalry as these teams have matched up every year in the state playoffs in the last six years. La Crosse finished as state runner-up in ’13 and ’11 after victories against Meade in the playoffs. Meade defeated La Crosse in ’09 (and then lost to Smith Center), and then beat the Leopards in ’10 and ’12 en route to state championships. This marks the first first-round meeting in the current run. This season, both squads have collected several close victories en route to 8-1 seasons. A young and inexperienced Meade squad earned close wins against Southwestern Heights, Cimarron, and Marion before losing by one point in district play to Elkhart in Week 8. It marked Meade’s first district loss since it played at La Crosse in district play in 2008. La Crosse defeated Larned, Minneapolis and Oakley in close games. For La Crosse, standout senior Sheldon Schmidt, who has missed parts of the last two years because of injuries, finally got to play against Oakley in Week 9. He will have his first opportunity against Meade on Friday since his freshman year when he just played on special teams. Schmidt has 61 tackles, nine for loss. Sophomore Kaleb Sherman, a huge surprise in coach Jon Webster’s eyes, has led a strong defense with 73 tackles, eight for loss. Sophomore Jasey Woods has 66 tackles, 11 for loss. Senior quarterback Jack Garcia has completed 35 of 86 passes for 832 yards with 10 scores against 11 interceptions. Meade has had several young players step up, namely sophomore Lawson Luetters, who has completed 24 of 41 passes for 417 yards with eight scores against four interceptions. Five rushers have between 541 and 611 yards in the single-wing offense. Junior Kash Larrabee has 61 tackles, seven for loss, to lead the defense. The difference in this game could come in turnovers. Meade has just six turnovers this year, while La Crosse has 22 miscues, though some of the interceptions have come at end-of-half plays or odd situations. La Crosse, though, has too much talent and experience on both sides of the ball. It’s going to be a great game, but the Leopards’ talent and home field advantage leads to the win. This is a rematch of last year’s first round game that Oakley won at home. Elkhart, with its win against Meade, collected the District 8 crown and the right to host this match-up. The Wildcats have made a big shift from a wide-open passing attack to a ground-heavy game. This year, Elkhart has averaged 272 rushing yards per game and 109 passing yards a contest and ran 60 plays a game. Last year, Elkhart averaged 222 passing yards a game, 236 rushing yards a contest and 64 plays per game. Junior Tanner Burnett has 244 carries for 1,674 yards with 16 scores to lead the Wildcats offense. Burnett also leads Elkhart with 86 tackles, 15 for loss. After a rough start against some strong opponents, Oakley won four in a row in district play under first-year coach Ty Pfannenstiel, and then lost 27-21 at home to La Crosse in overtime last week. Oakley, which led Kansas in scoring defense last season, has resembled last season’s unit in the last five weeks. Oakley has permitted just 59 points in the last five weeks. This is going to a close, low-scoring game. Oakley has been battle-tested a bit more than Elkhart and has great players in Ryan Kuhn and Dylan Gassmann. Burnett, arguably one of the state’s more underrated players has put together a great season and career. I expect Oakley to do just enough to win.